A customer suggested this design to us in August, and bought one as a birthday gift. 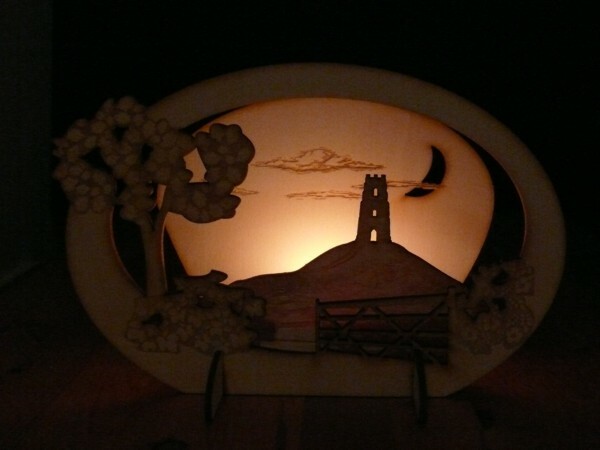 It depicts Glastonbury Tor in Somerset (just across the Bristol Channel from us), a site that’s well loved by Christians, modern pagans and anyone who appreciates beautiful landscape and mysterious history. I was really pleased with how it turned out, but we’ve kept it under wraps until we were sure that the recipient’s birthday had come and gone! Now September is over, the Glastonbury Tor candle arch can take its place alongside the others. This entry was posted in New design, Uncategorized by Richard Dunstone. Bookmark the permalink.